If you're a water baby, you should spend the weekend close to the beach, enjoying the cold night air and the stars above. This campsite is not too far from a secluded beach at Kashid, and gives you the chance to walk along the sands, listen to the waves, and indulge in a host of fun activities. You can go for a swim, try fishing, or play a game of beach volleyball (none of these activities are included in this package). You'll enjoy a day of outdoorsy fun and end the evening with a merry bonfire. You'll camp in weather-proof tents with foam mats, blankets and pillows to ensure you get a good night's sleep, with comfortable toilet and shower blocks nearby. This beach campsite is located on a farm in Kashid, with a private beach that is just a stone's throw from the tents. While the main Kashid beach attracts visitors, your beach is secluded, with soft white sand and clean water to swim in. You'll be able to park your car close by (parking fees not included in this package), and smell the salty sea breeze immediately. With the sea close by, you'll alway have soothing views, so do make sure you catch the sunset, or at least an early morning. • Spend the weekend camping on a secluded beach in Kashid. • Learn how to light your own bonfire. • Sleep in cosy alpine tents that open to scenic beach views. • Enjoy an outdoors experience at a lovely beach. Beach camping at Kashid is a non-strenuous activity, and is suitable for everyone. However if you have a heart condition, allergies, or respiratory condition, please check with your doctor before booking this beach camping at Kashid. Please avoid the consumption of any narcotic/ psychotropic substances during the beach camping. Any participant found doing so will be requested to make arrangements to return back to their home at their personal cost. Participants must refrain from littering and defacing their surroundings. Guests accompanied by their drivers will have to pay separately for the driver charges in advance. For cancellations made 6 days or more before the departure date of the Kashid beach camping trip: 30% of the booking cost will be refunded, minus any transaction charges. For cancellations made 0-5 days before the departure date of the Kashid beach camping: No refund. No refund will be permitted if the beach camping trip is shortened or cancelled due to reasons beyond the control of the operator. These include climatic conditions, governmental/quasi-governmental policies, mechanical and human error in hired vehicles, etc. Children under 5 years stay for free. Children aged 6-10 stay for half price. Children aged 10 and above are charged full price. Participants will have to fill an indemnity form before beginning the beach camping at Kashid. There is no pick-up for this Kashid beach camping trip. There is no drop-off point for this Kashid beach camping trip. You can check in any time after 16:30 hrs. Once you've settled into your tents and had a hot cup of tea, you can set off to explore the surroundings and check out the beach. Enjoy a game of beach volleyball, or go for a quick dip in the waters while the sun sets. After that, as it grows dark and the weather gets cooler, a merry bonfire draws everyone closer. Spend a few happy hours in the company of your friends, with the stars above. You'll be served veg and non-veg barbecue, followed by a buffet style home-cooked dinner. When you're tired, you can retire for the night in cosy tents. Do wake up early so you can see the morning mist clearing. Enjoy a hot cup of tea and breakfast, and relax a bit. Your check-out time is 10:00 hrs. Trip ends here. Personal expenses such as extra meals, soft drinks, telephone calls, tips, porters, etc. Any additional expenses arising due to unforeseen circumstances such as landslides, roadblocks, political unrest, riots, etc. You'll stay at a well-maintained campsite with a secluded beach close by. 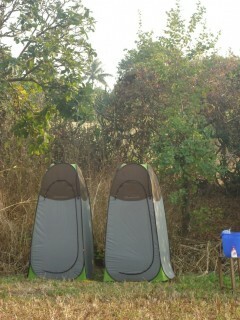 The tents are equipped with sleeping mats, blankets, pillows and solar lights, with built-up toilets and showers. You'll have limited veg/non-veg barbecue, as well as evening tea and biscuits. Dinner is served buffet-style, and both dinner and breakfast are home-cooked. You'll wake up early to get views of the sparkling sea, and enjoy a delicious breakfast and a hot cup of tea. Check out by 10:00 hrs. Trip ends here. The campsite is about 5 kms from Kashid Beach. Drive from Kashid Beach towards Murud road, and watch for a sudden sharp left turn with a steep incline. There is a village called Danda here. The closest landmark to the campsite is the KP Beer Shop, and you can ask for directions here.